A joint outdoor field trial by Mitsubishi and NTT DOCOMO in Japan appears to have achieved a “world’s first” by pushing the future 5G mobile network technology to deliver maximum throughput speeds of 27Gbps and 25Gbps (communication distances of 10m and 100m respectively) via one mobile terminal in the 28GHz band. The ITU’s official “minimum requirements” for 5G performance specifies that such technologies should be able to deliver a peak downlink speed of 20Gbps and an uplink of 10Gbps, although this varies depending upon the environment and amount of spectrum available etc. (details). However the field trial in Japan, which harnessed an antenna system with 16-beam spatial-multiplexing technology and 500MHz of bandwidth (16 x 16 MIMO), appears to have smashed through that by several Gigabits per second (Gbps) of extra performance. In this setup the base-station antennas were installed on the wall of a building, which then directed beams to mobile-terminal antennas installed on the rooftop of a vehicle. 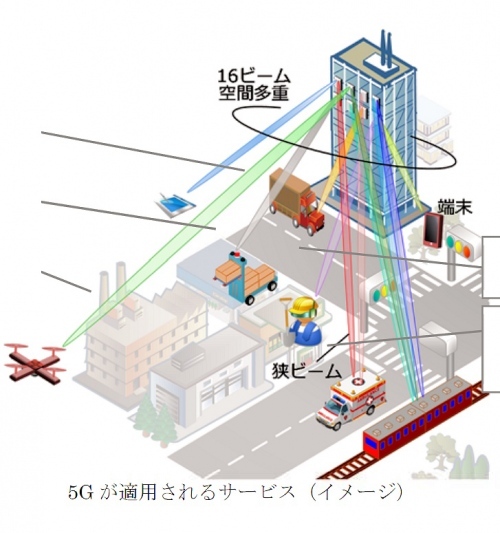 The test achieved the goal of the Japanese government’s research and development project to help realize 5G mobile communications based on high data-rate and low-power-consumption radio-access technologies and using an ultra-high-frequency band and extra-wide-bandwidth massive MIMO. The developed technologies are expected to enable wireless communications at ultra-high data rates of more than 20Gbps to moving vehicles with numerous passengers, such as buses. However you’d need an extremely dense urban network and masses of fibre optic fed capacity in order to fuel this kind of setup in the real-world, which would be very expensive. Real-world performance would also be significantly slower due to the usual impacts of interference, capacity and demand etc. By comparison a top-end conventional 4G network using 60MHz of bandwidth (4 x 4 MIMO) achieved 988Mbps over a similar distance. Very good but obviously not a realistic scenario for a production network. 10-100 meters? That’s Wi-Fi not mobile! Mobile needs to cover wide areas. Yes the ‘use case’ mentioned is also a bit odd for 28GHz, since that’s generally better for connecting premises rather than buses. Still it’s a good model for what may be possible much further down the line, when 5G is more mature. It took years before 4G even got close to Gigabit speeds and that too was shown in very early tests a good few years ago.